Green Valley is the one major city along the 60 miles of I-19 between Tucson and Nogales, situated on a vast, gently sloping desert plain, with distant mountains east and west. The city stretches for seven miles along the interstate; shops and other facilities are concentrated around three exits: 63 (Continental Road), 65 (Esperanza Boulevard) and 69 (Duval Mine Road). This latter leads to the largest of several copper mines in the area. Green Valley is popular as a retirement community, partly due to the quiet, scenic location and the mild climate, slightly less extreme than Tucson, 20 miles north. This area is well placed for explorations of the Santa Rita Mountains to the southeast, accessed by the paved Madera Canyon Road. One more unusual attraction is the Titan Missile Museum, preserving the last remaining US missile site from the Cold War era. 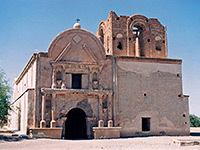 Tumacacori National Historical Park is 22 miles south. Green Valley's Best Western hotel is located in a residential neighborhood on the main road through town (La Canada Drive) - one block south of Esperanza Boulevard, which meets I-19 at exit 65. The 105 room hotel encloses a tree-lined quadrangle with an outdoor pool at the center, and includes a full service restaurant (free hot breakfast available) and 24 hour exercise facility. The Best Western is right next to Green Valley Mall, which features more than 80 restaurants and business outlets. Guests here to work have use of a business center and 475 sq ft meeting room. All rooms contain a microwave & refrigerator, while some have a sofa bed and mountain views. Guests at Comfort Inn Green Valley appreciate the friendly staff, the reasonable rates, the clean & extra large rooms, the better than average free continental breakfast, and the central location - next to I-19 exit 65, just over the road (Esperanza Boulevard) from Green Valley Mall. The hotel has a small outdoor pool (and hot tub), on the quiet west side of the building, away from the interstate. There are two restaurants sharing the same parking lot, and plenty more a little further away around the mall. Also available at the Comfort Inn are a meeting room, fitness center, basic business services, and a microwave/refrigerator in each guest room.